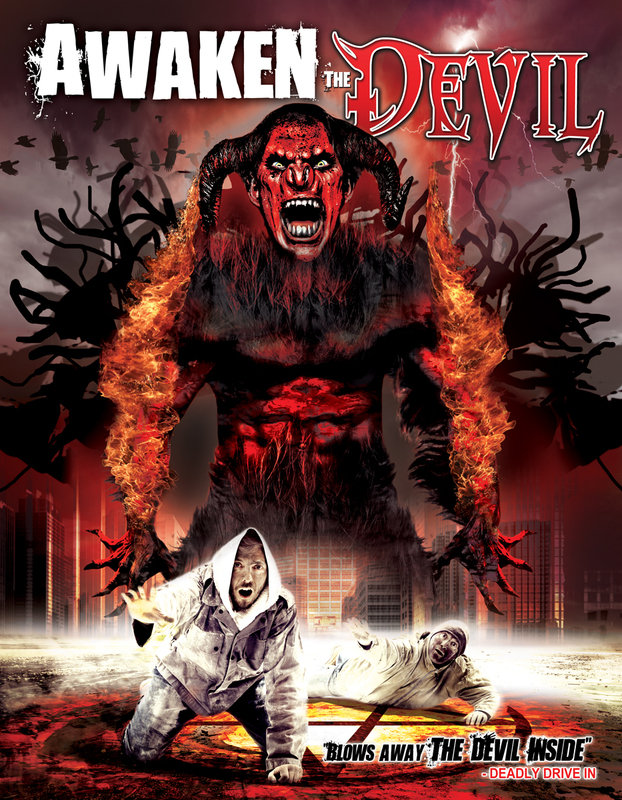 Movie Graveyard Reviews: Awaken The Devil!! Awaken The Devil! Pretty cool title, also, as you can see above pretty cool cover art. Its also a pretty cool film with a pretty cool visual concept. Think Sin City meets Scanner Darkly with a smoke like effect instead of full blown animation. Its the story of two brothers Vernon and Tom Dopple. Things aren't going to good for them. For starters Vernon can't talk, or walk, he gets pushed around in his dilapidated wheelchair by his brother Tom. He does have a little chalkboard he writes things on. Its ok he can't talk,because Tom never really shuts up. Also they are homeless, and even more also Vernon can see demons. One night they decide to bed down in an abandoned building. I'll say it again fans. Nothing good happens in abandoned buildings in movies. Nothing good happens here either as they find a dead girl laying by a giant pentagram. From there it really goes downhill as there trapped in the building that's inhabited with some type of evil. They start changing as,well as Vernon starts getting better in terms of his health while Tom begins to deteriorate. Its as if there switching body's. Is this the work of the Devil himself? Besides the obvious cinematography that sets it apart from other films the general tone is also much different than a standard horror film. This doesn't play as your typical blood and guy devil worship type horror film. This plays off more suspenseful. Its like watching a spiritual battle for someone's soul. The acting is also very impressive for a small budget production. Both leads are fantastic. You really believe that they are experiencing what you are watching. There interaction with each other is fantastic to say the least.